PSX Mega Man X5 (USA) in 16:51.08 by Mothrayas. In an effort to avoid status quo, Capcom decided to experiment with this game, throwing in a leveling system and story-based launch scenarios. Beyond that, it's really just a Mega Man X game Zero game. 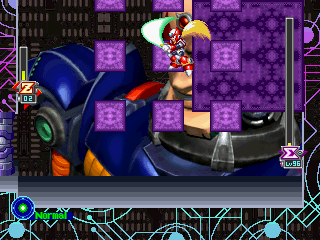 This game is the first Mega Man game to allow choosing, each stage, one of two playable characters, X or Zero. However Zero is judged as the greater of the two, so X is left behind gathering dust. The abuse-able sword physics points to Zero's superiority, especially when the sword is used while standing on the ground. Bosses fall very quickly, even when they have 127 health. The downside to Zero's sword is the delay when the sword hits in the air. There is about 5 minutes of action in this run, which consists mostly of flying through levels and boss rush on the hardest difficulty mode, Xtreme. This run is ~8 seconds faster than the previous run. We also have a run which completes all stages.